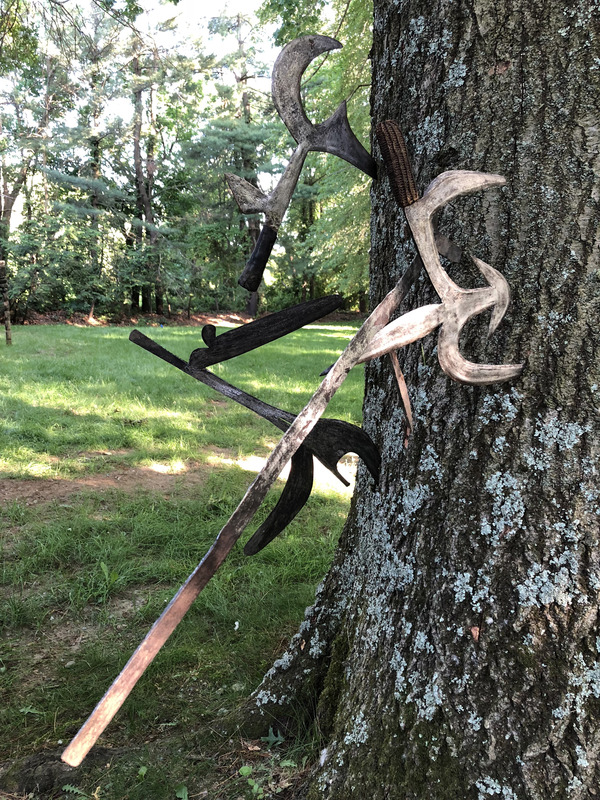 The US based dealer Ethan Rider, specialized in African knives, had a fun afternoon of experimental ethnology recently when he decided to actually for once try out the Congolese throwing knives he’d been selling for years. The pictures and videos that he produced that day are worth a look and can be found here. Especially the last video, with the Banda knife, is very impressive. It’s amazing to see these flying through the air. Don’t try this at home! 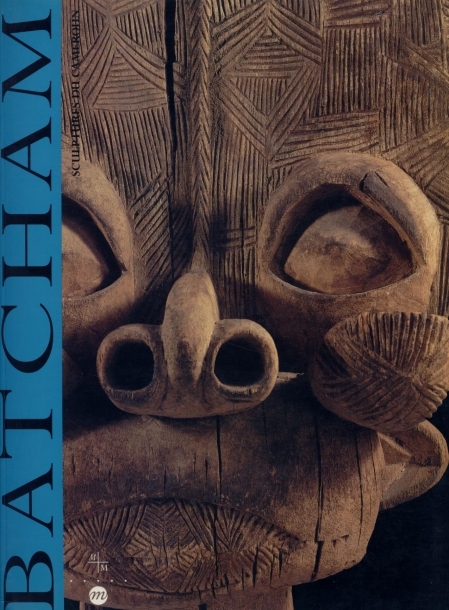 ps in the last issue of Tribal Art Magazine, Ethan also wrote a great expose about fake African knives made by the Austrian blacksmith Tilman Hebeisen together with Wolf-Dieter Miersch; you can read it here. This entry was posted in Objects on August 9, 2018 by admin. Last month in New York, I came across this amazing tattoo of a Songye kifwebe mask. This famous mask resides in the collection of the Penn Museum at the University of Pennsylvania Museum of Archaeology and Anthropology in Philadelphia. It was sold by Charles Vignier in Paris in 1919 to Marius de Zaya and was one of the stars of Yaëlle Biro’s exhibition at the Metropolitan Museum of Art, African Art, New York, and the Avant-Garde in 2012 (info). Learning about the mask’s role within late nineteenth century Songye communities as an agent of social moderation – marking life events and safeguarding secret knowledge – furthered my fascination. 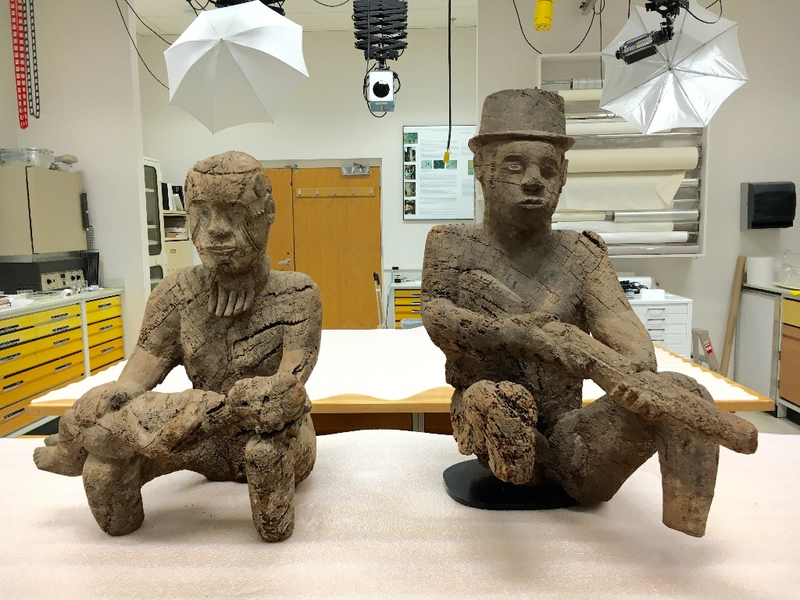 Kifwebe epitomize the scholarly challenges associated with African objects arriving in European and American collections during the first decades of the twentieth century. 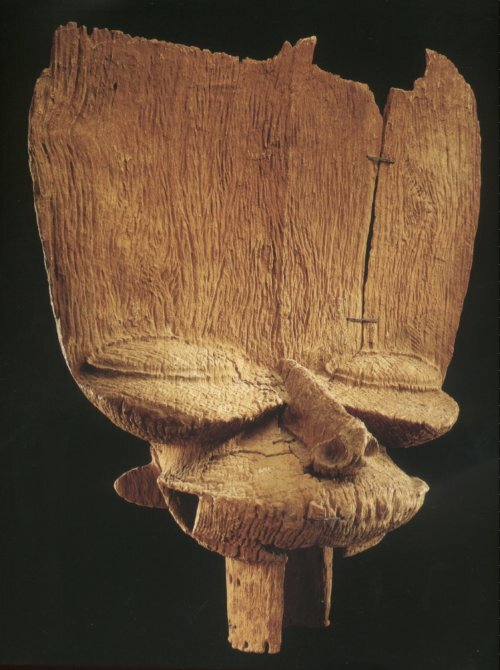 Elucidating the complex epistemologies from which these objects emerged, given the extremely partial and biased historical record resulting from colonialism, drives the field of African art history. The mask’s personal significance contributed to my choice to inscribe it permanently on my person. 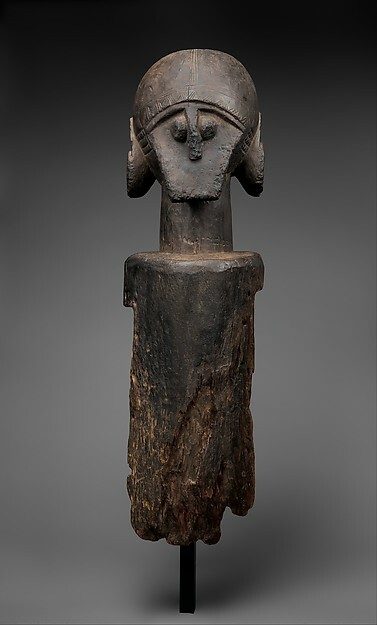 It was included in the Metropolitan Museum of Art’s exhibition African Art, New York, and the Avant-Garde on which I assisted as a graduate curatorial intern, and belongs to the Museum of Archaeology and Anthropology at the University of Pennsylvania, where I am completing my PhD. Both of these institutions and the individuals that comprise them have shaped not only my approach to and understanding of art history, but also life more generally, in innumerable positive ways. 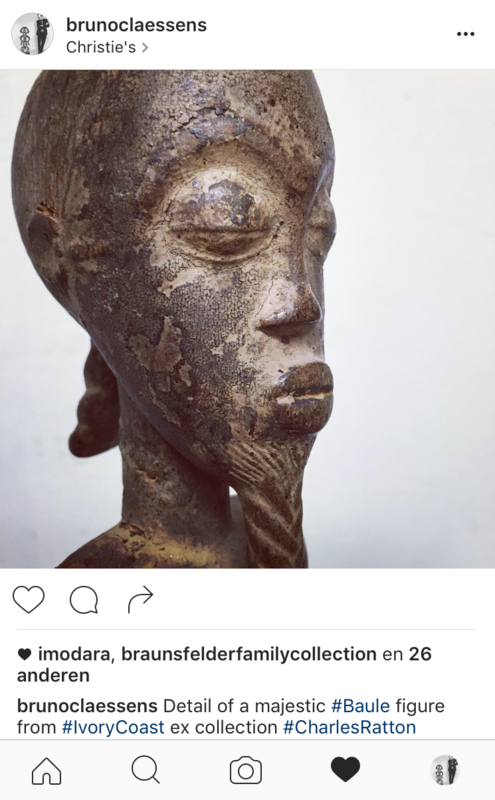 Whitham is currently writing a dissertation on the impact of African art on the Dada movement as a PhD candidate in the History of Art Department at the University of Pennsylvania. She will especially focus on Tristan Tzara (1896-1963), the Romanian avant-garde poet and African art collector who played a pivotal role in the the development of Dada. Her dissertation aims to fill the lacunae in scholarship on Tzara’s role in the development of twentieth century collecting of African art as well as to demonstrate how Tzara’s interest in African art impacted the development of the Dada movement. So please do get in touch if you would happen to own an object once in the possession of Tzara! 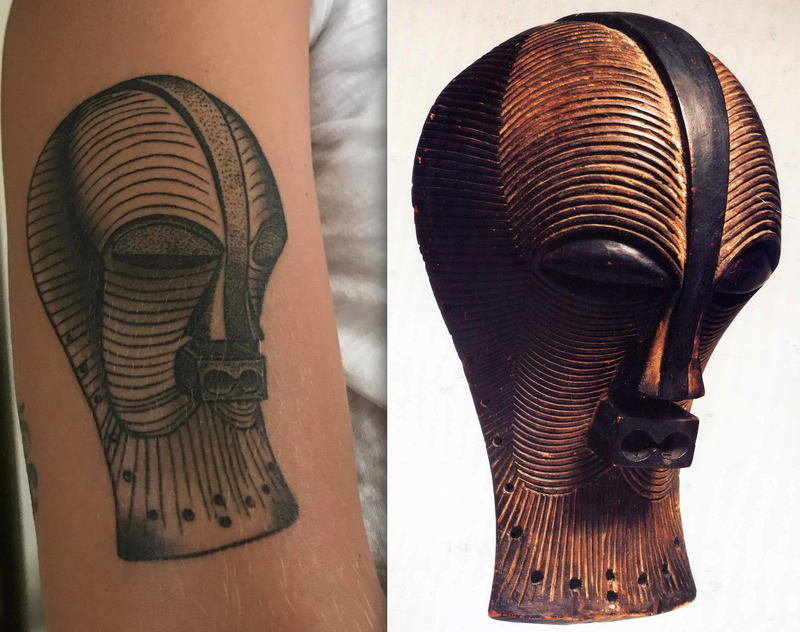 ps I’m sure there are more African and Oceanic art inspired tattoos around, so don’t hesitate to send a picture (and its story) if you’re willing to share; thanks. This entry was posted in Objects, Research and tagged Songye on June 12, 2017 by admin. 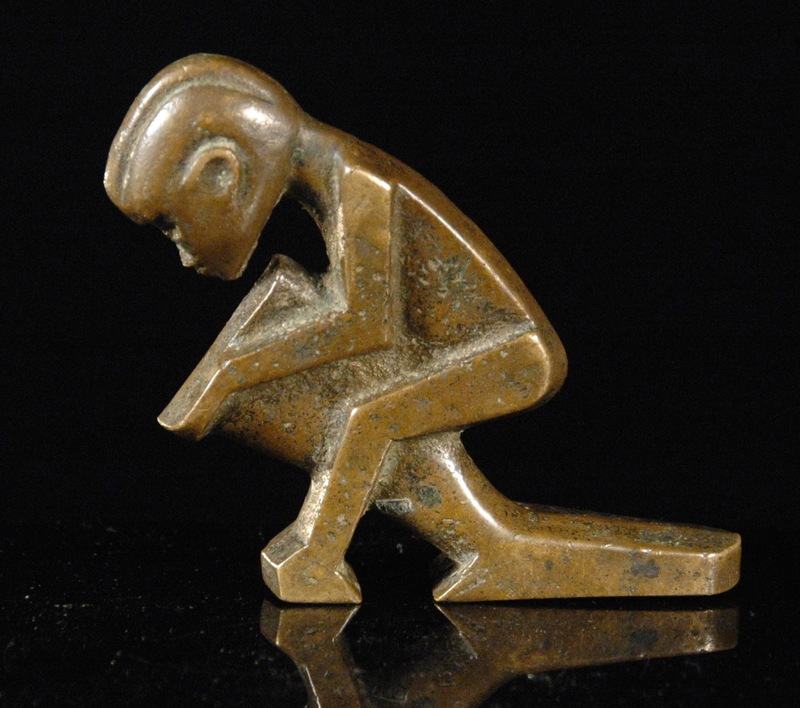 These last few days there was a lot of buzz in the air in the circles of collectors and dealers in Maori art. Did you hear about this previously unknown flute in a small UK auction? Of course one did! Thanks to the well-consulted live online auction site The saleroom even the smallest British auction house (in this case in the small village of Haslemere, Surrey) now can reach a global audience. Even if mislabeled, so many aficionados are browsing these sales, that no sleeper stays unnoticed. Estimated at only £50-100, this masterpiece was bound to make a top price. A few were somewhat skeptical about this offering. Surely it should be clear, even to the untrained eye, this is not a pipe. A one second google search would make that very obvious. They got the culture right, at least. 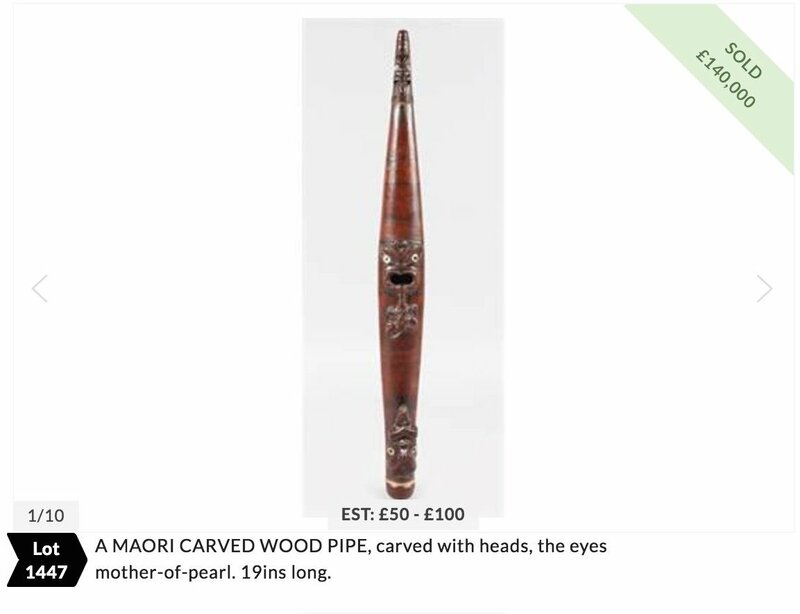 In my view, just five minutes on google would eventualy end at the beautiful Maori flute we sold at Christie’s Paris last year. So, the auctioneers, or didn’t do their homework – but why then illustrating the lot with so many professional pictures ? – or did know the object would make what it is worth anyway and hoped to generate a lot of extra buzz with the low estimate. 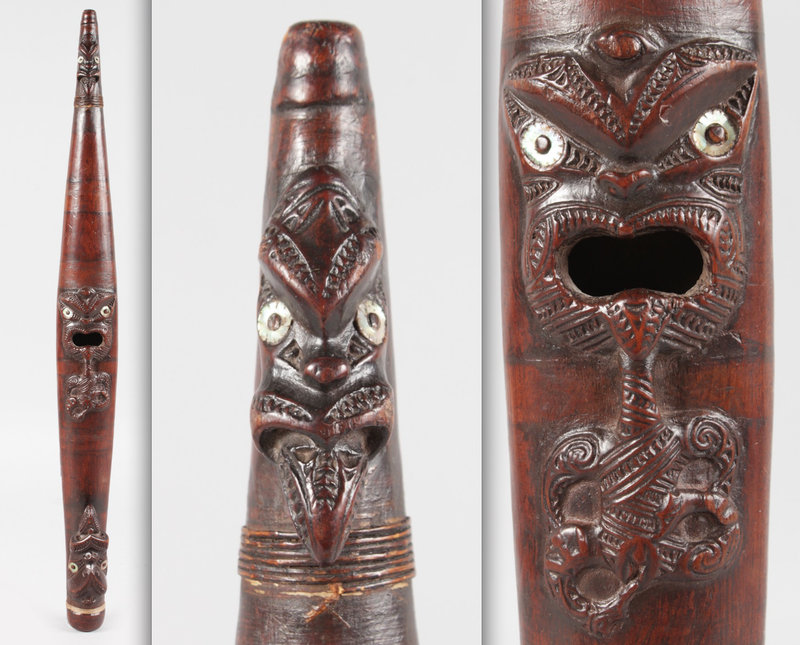 It did work if that was the case, as this exceptional Maori flute sold for £140,000 (without premium) this afternoon. With costs, the total price is around £180,000 or € 210,000 ($ 225,000). This might sound as a lot of money compared with the estimate, but in fact this still is a very good price for it and I’m sure we’ll see it again sooner or later. Now, you’re probably wondering how these flutes sound like ? Well, you can hear (and see) Richard Nunns play an early 19th century putorino form the Oldman collection below.. This entry was posted in Auctions, Discoveries, Objects and tagged Maori on February 23, 2017 by admin. As you can see, with the proper effects it’s easy to create some wonderful shots. Below some more of my recent posts.. This entry was posted in Objects on October 31, 2016 by admin. UPDATE: a reader writes that the third tooth is an upper premolar. This entry was posted in Discoveries, Objects and tagged Fang, Ntumu on September 17, 2016 by admin. Image courtesy of Gi Mateusen. I came across a remarkable bronze object today. 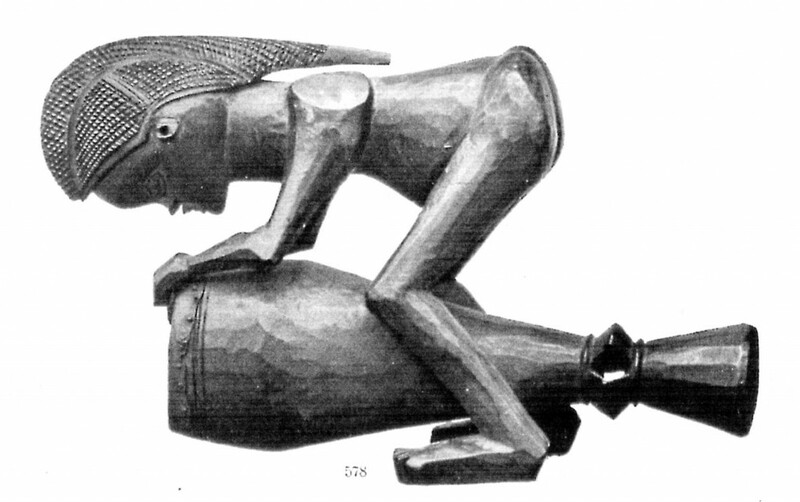 It’s clearly inspired on the famous Mbala statues of a drummer (as illustrated below), but it’s not in wood and much smaller. Image courtesy of the Royal Museum for Central Africa, Tervuren, Belgium. 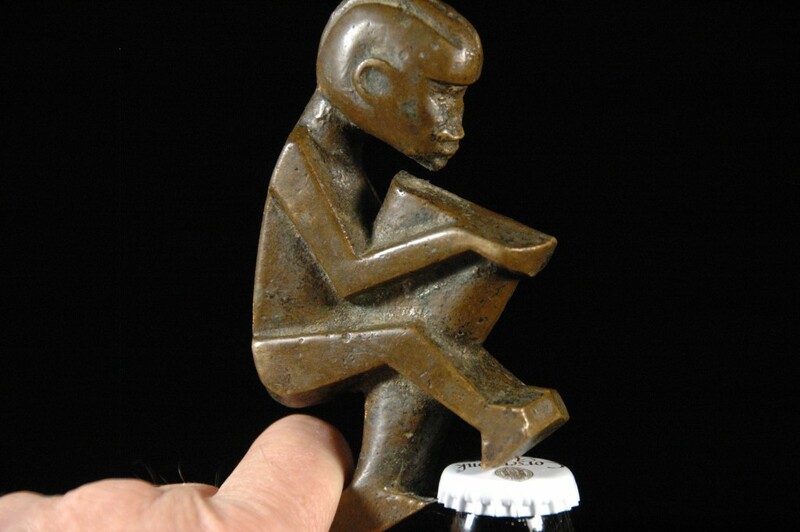 The owner of the object was so kind to reveal the object’s function to me: a bottle opener, made for Belgian colonials, to be used during rituals involving beer 🙂 This object had a deep patina indicating extensive ritual use! These could be bought on Kinshasa’s craft market and were probably made far from the Mbala region to be sold as a souvenir of a visit to Congo. 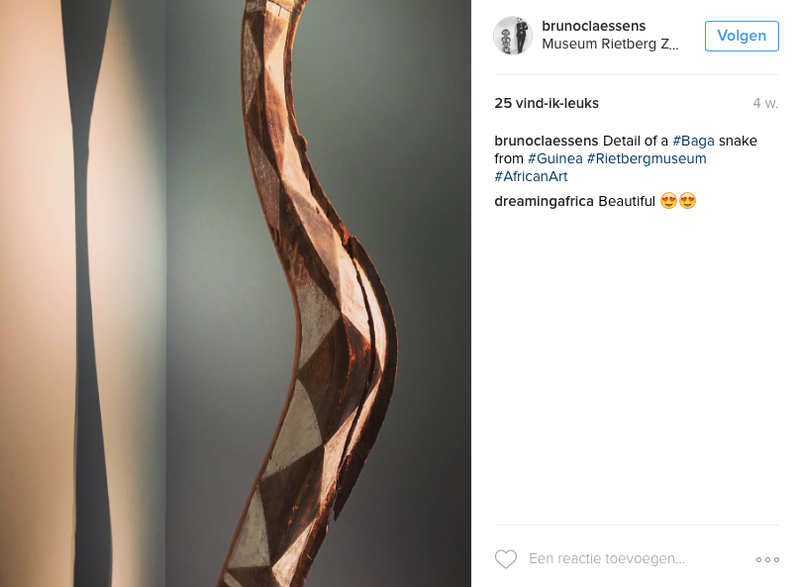 This entry was posted in Discoveries, Objects and tagged Mbala on February 9, 2016 by admin. Pende mask, D.R. Congo. Height: 30 cm. Image courtesy of Studio Philippe de Formanoir – Paso Doble. Collection Javier Peres, Berlin. 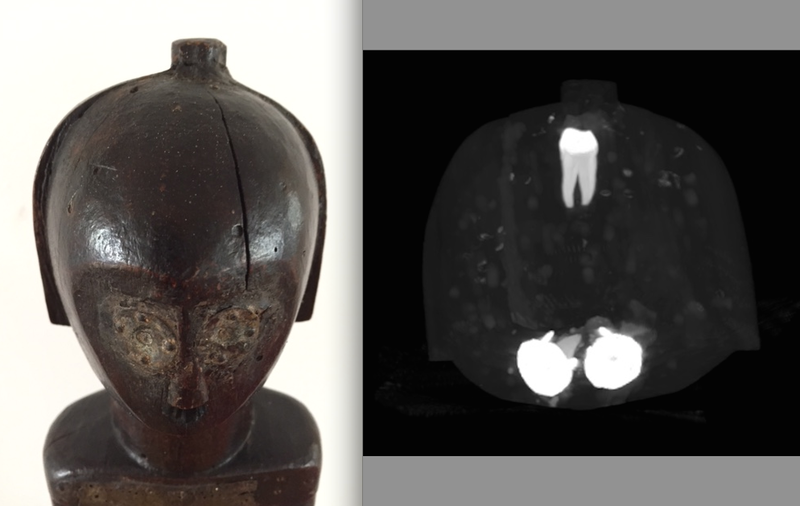 The above Pende pumbu mask was acquired with my assistance at BRAFA in Brussels in January. 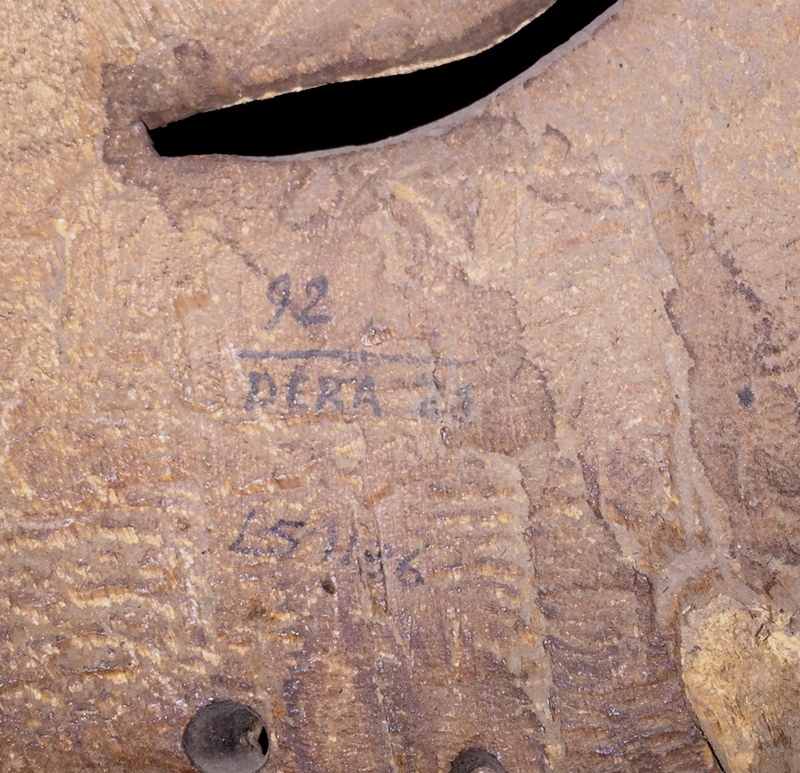 While inspecting the mask, I spotted the below inventory number on the inside of the mask. While the dealer had missed it, I immediately recognized the style of this inscription.. I had seen this type of labeling before and was pretty sure it was done by Frans M. Olbrechts for his 1937 exhibition in Antwerp’s Stadsfeestzaal. Back home, I consulted the (rare) exhibition catalogue and checked the upper number of the inscription (92), which proved to be a Pende mask! Note that the majority of objects in the catalogue was not illustrated. 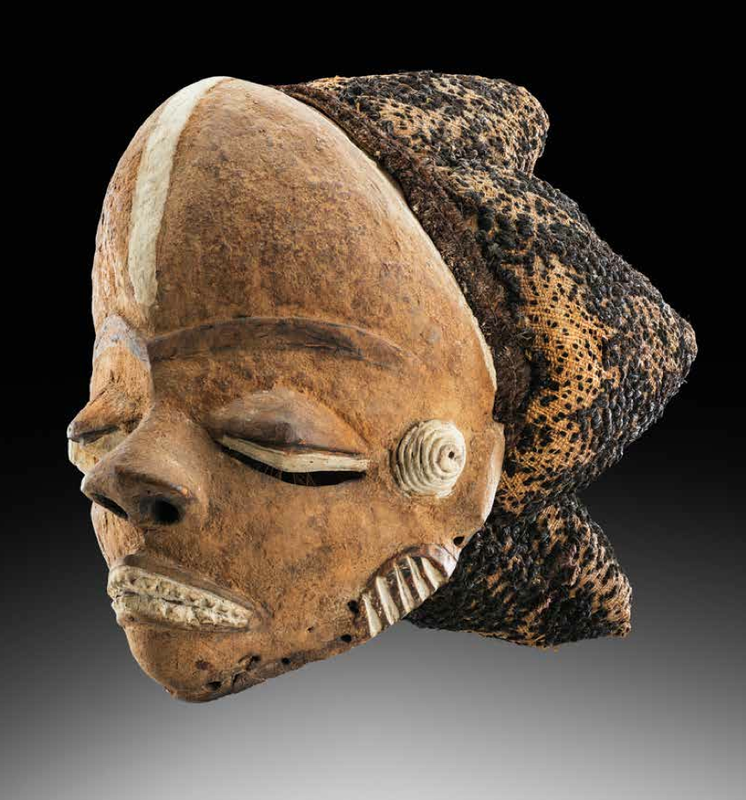 However, a second confirmation that this mask was in the famed ‘Tentoonstelling van Kongo Kunst‘ came in the form of the lower line of the inscription: it starts with an abbreviation of the consignor (DERA), followed by the number of the object consigned by that collector. 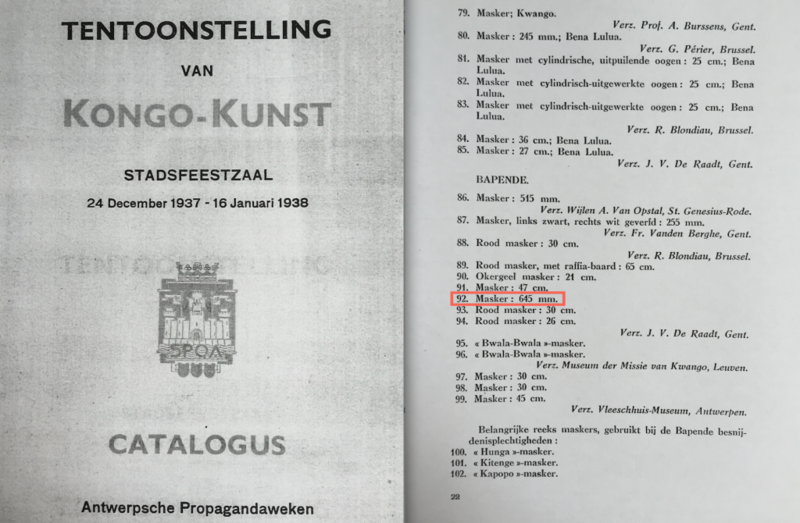 As the catalogue listed J.V. De Raadt as the consignor for mask no. 92, it’s certain the above mask was in the 1937 exhibition. I haven’t been able to identify the second inventory number, but it looks even older. 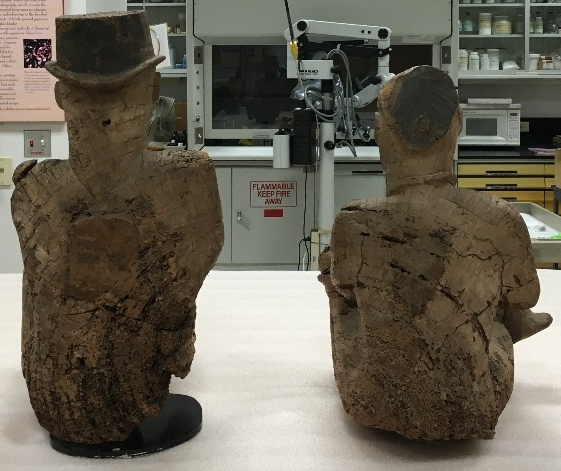 So, I (and the masks’s new owner with me) am very happy that after all these years, an important piece of the object’s history was rediscovered. ps a day of sleuthing later revealed the existence of two more masks from this carver, see below. 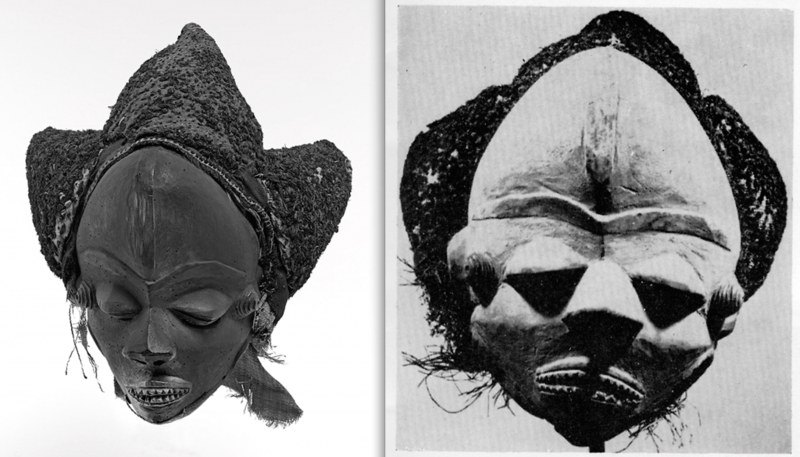 The mask on the left is in the Collection Museum aan de Stroom (former Ethnographic Museum), Antwerp (AE.0551), and was purchased from Henri Pareyn on 13 April 1920; the mask on the right was sold in Paris by Boisgirard on 19 February 1968 (lot 110) – its current whereabouts are unknown. This entry was posted in Discoveries, News, Objects and tagged Pende on February 9, 2016 by admin. Jukun headdress, Nigeria. Height: 114,3 cm. Image courtesy of The Metropolitan Museum of Art, New York (2015.445). Purchase, Pfeiffer, Leona Sobel Education, 2005 Benefit, and Dodge Funds; Gift of Dr. Mortimer D. Sackler, Theresa Sackler and Family; Andrea Bollt Bequest, in memory of Robert Bollt Sr. and Robert Bollt Jr.; Elaine Rosenberg, James J. Ross, and The Katcher Family Foundation Inc. Gifts, 2015. 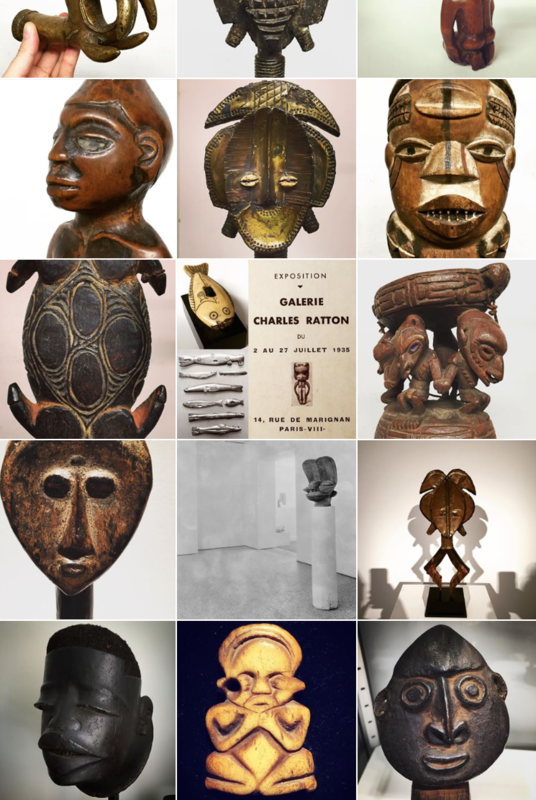 2015 certainly was a great year for the African art collection of The Metropolitan Museum of Art. Apart from an iconic Hemba statue, the museum also bought an excellent Jukun headdress. This shoulder mask was published in Elsy Leuzinger’s Die Kunst von Schwarz-Afrika (Zürich, 1970) – and featured on Jacques Kerchache New Year’s Card of 1971. 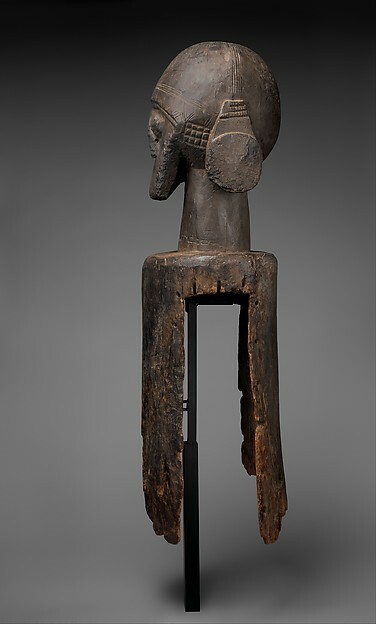 It was ‘collected’ in Cameroon in 1968 or 1969 by Philippe Guimiot, acquired by Kerchache and then in a private collection from 1994 to 2015. I do hope European museums are taking note how the Met continuously is able to fortify its collection thanks to the generous contributions of several donors. Government grants practically reduced to zero, the ‘acquisitions’ of many of them unfortunately are limited to the occasional bequest. Of course, in the EU, there’s no beneficial system of tax-deductible donations as in the States – a not to be underestimated factor. This enigmatic and arresting creation of a Jukun sculptor active in central Nigeria’s Benue River Region was a kinetic ancestral sculpture. According to accounts gathered by researchers, such works were animated in performances devoted to agricultural rites as well as to those relating to initiation of young boys into adulthood. Access to those events was highly circumscribed. Women, children, and outsiders were not allowed to view those nocturnal apparitions. The form is purported to have been manipulated by a person who used the lateral apertures to support and raise it. Perforations around the perimeter of the lower half allowed for the attachment of a vegetable fiber costume. The upper half distills an ancestral presence to essential features that are dramatically amplified. Crowning the summit is the majestic dome-like volume of the head. The eyes project in bold relief from the flat surface of the face and teeth are incised on the underside of the straight line of the mouth. At either side the flat discs of earflares favored by regional elites are emphasized. Adoption of Christianity and Islam during the first half of the twentieth century led to the abandonment of this minimally documented tradition. Currently the object is not on view, but I hope that will change soon! This entry was posted in Museums, News, Objects and tagged Jukun on January 26, 2016 by admin.